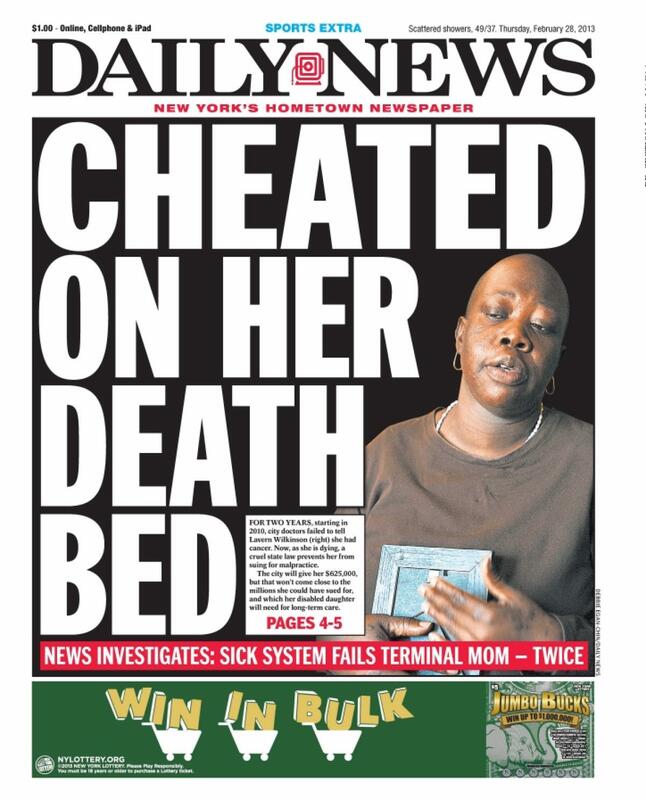 A month ago I posted about New York’s need to pass “Lavern’s Law,” which extends the statute of limitations in medical malpractice cases from the time the discovery of malpractice was made, or could reasonably have been made. The problem, as I noted back then, was that some folks lost their rights due to our short statute of limitations — 2 ½ years for most cases and a mere 15 months against a municipality — before they even knew they had an undiagnosed cancer or other condition. The Assembly had, in prior years, passed the bill. The obstruction was in the Senate. A couple hours ago, though, the Senate passed the bill. Or at least a version of the bill. While the original version related to discovering malpractice in general, the Senate version is restricted to undiagnosed cancers and other malignant tumors. This is a victory for consumers no doubt, in that some of them won’t have the courthouse doors slammed in their faces before even being aware they had any rights to begin with. The law is named for Lavern Wilkinson, who went to Kings County Hospital on February 2, 2010 with chest pain. A radiologist saw a suspicious mass on the x-ray. But Wilkinson wasn’t told. The bill had bipartisan support, and passed the Senate by a vote of 55 to 6. Reconciliation with the Assembly is next, and assuming that happens, on to the Governor for signature. The extension of the statute of limitations is not forever, of course. It starts to run from the date of discovery, and the time to start suit will end seven years later, even if the cancer is not discovered. This is all very good for New York’s residents. Should they fall victim to malpractice, they have to worry less about being victimized a second time by an unjust civil justice system. Updated: The Assembly has now passed the same bill. It goes to the Governor for signature. He had previously been a supporter of the law. Although not a NY resident, I have a minor ironic attachment to medical cancer malpractice. In a routine company physical I was diagnosed with high blood pressure. Can you say “fat”? I was referred to a list of specialists, and the one I selected was in the richer part of town, but I selected him because he had the same last name as a doc I had had years ago outside of Pittsburgh. Of such things are stories made. Anyway, we got along fine and I followed his advice and I’m still (nominally) alive. Then one day I got a call to come to his office and pick up my records. All my records. Ok, I assumed he was retiring. No, he was dying. Of esophageal cancer which had been misdiagnosed by his oncologist.